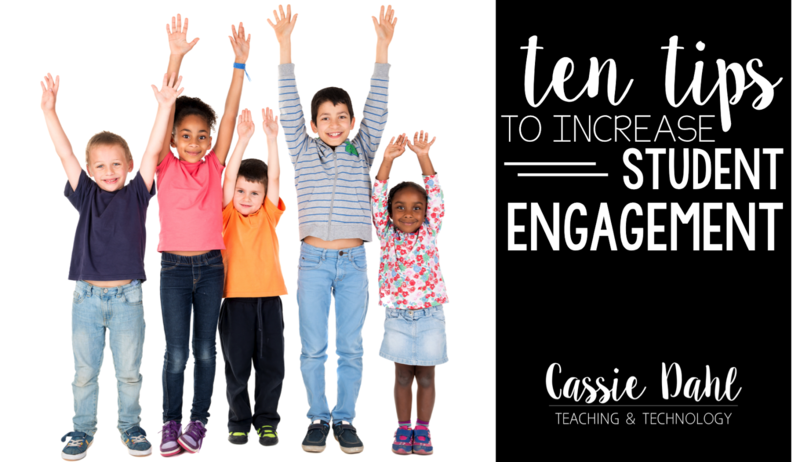 Engaging all of your learners all of the time is nearly impossible. But, you can get pretty close! 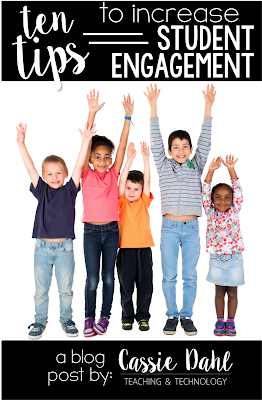 Here are my top ten tips for increasing student engagement in your elementary classroom. This year, I have a group of wiggly students and they definitely have a hard time focusing. At times I feel like I am teaching the wall instead of my 20 students. I have been implementing these and have seen a huge change in my classroom atmosphere and achievement. 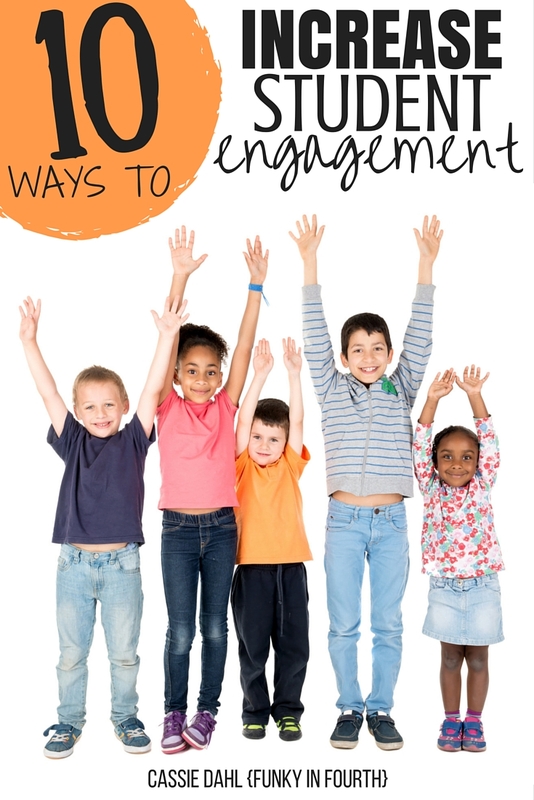 #1: Get your students up and moving. I love to do scavenger hunts around the classroom or tape task cards to my walls and students move around the room to each task card. They are getting up out of their chairs and learning at the same time! #2: Use games! This could be math games, guided reading games for increasing sight word fluency, or whole group review games. My students have been loving powerpoint games that we have been playing to work on fact fluency. #3: Incorporate current events. Let's face it... sometimes the basal text book or leveled readers are a tad bit boring. My students have been loving applying our reading skills with current event news articles. #4: Integrate technology throughout your day. This can be a bit tricky, especially for teachers who have limited devices in their classroom. Even just one device can make a difference! Check out my Pinterest board for Tech Integration here. #5: Give a "teaser" for an upcoming lesson. I love to hook my students days before a lesson. I might do this by placing a sign randomly around our room, adding a little hint to our weekly newsflash, or sharing a quick video to HOOK them prior to a lesson! #6: Try out Interactive Notebooks! This is tool that has been gaining momentum in the last few years in classrooms across the country. We have an interactive notebook for math and one for reading too! On the left side of the notebook spiral we place "teacher items". These are mini-anchor charts, definitions, teacher-led examples, etc. On the right side of the notebook spiral my students practice the content, prove their work, state the evidence and reflect on the learning. They can get out their INBs anytime they need to as a reference! #7: Give your students choice. My students love being given choice and it is crucial in helping them develop necessary skills for life. During the beginning of the school year I give them small choices and we slowly build on them each day! Soon after, they are making choices about what they want to learn, how they want to learn it and giving ideas to extend their learning! If you have not heard of Genius Hour, that would be one way to add some choice into your classroom. Other ways would be to allow your students to choose where they sit for the day, ask them if they would rather read to self at the beginning of reading or at the end, allow them time to free-write about anything they want, during math games- offer a variety of choices for them to chose from. The list seriously can go on and on. Just release that power. It won't be easy but you will be amazed by what your students are capable of! #8: Add in some brain breaks. This one should be an obvious one, but I am going to point it out anyhow. Picture yourself sitting in a staff development session. You know, the one that seems to drag on and on. Sometimes that is how our students are feeling! Get them up and moving with a quick brain break and then refocus back to the lesson. The 2/3 minutes that you spend on the brain break, will easily be gained back with the attention and behavior after the break. #9: Consider flexible seating in your classroom. This might not be an immediate go-to for every teacher. It really needs to be something that fits your teaching style and more importantly your students needs. In my classroom we have crate seats, regular chairs and exercise balls. Our classroom also has a standing table and a table that has been lowered to the ground where my students can sit on rugs. #10: Lastly, don't be afraid to think outside of the box. #befearless Just because a teacher down the hall does something one way, doesn't mean you need to do it just the same. Do what is best for your class. Do your classroom YOUR way.